Everyone who operates a PV system with SMA inverters should register their system in Sunny Portal. Additionally, customers who have an inverter with the SMA Smart Connected convenience package, such as Sunny Boy 3.0 – 5.0, have to activate the SMA Smart Connected in Sunny Portal as part of the package. Once activated, PV system operators can start reaping the benefits of the convenience package. 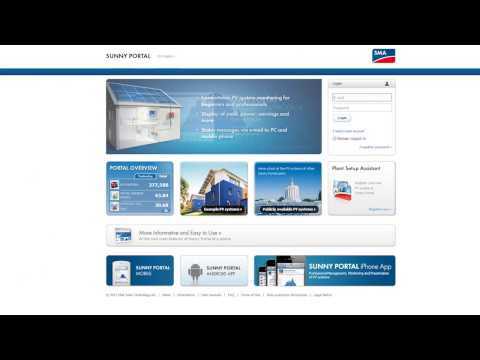 This video shows how to register and activate a PV system in Sunny Portal. For more tech tip videos, for example on installing a Sunny Boy 3.0 – 5.0, visit our YouTube channel. I want to purchase a solar hybrid inverter system 3kva for my home use at Lucknow india please advise me availability and price quote in india. for your home application, a Sunny Island system is suitable. You can find information in this link. SMA does not sell directly to end users. But you can get prices on google or from your preferred installer. Would you be so nice to write your comment in English otherwise we cannot help you. I installed SMA invertor 3 years ago. It stopped working 4 months ago and the technitions (from Top Notch Electrics) say they cannot get a replacement Invertor from you. Is this true and why? My electricity bills are now enormous ! I am sorry to hear that. Please contact our Service Team in Australia to clarify your issue. Thank you. Hi, I had problems about activate my account on Sunny Portal. Received email registration, but when I follow this link to confirmation, doesn’t confirmation. Have some problem to registrate South Americans users? for your individual request please contact our online-service-center. Our colleagues will contact you. I can connect to the inverter WiFi, so not sure why I cannot complete registration? can you please sign in on our Service Line to get help. The colleagues can log in on your system to see where the problem is. Plese help me to register my Sunnyboy SB 5000US. This unit is from 03/2012 But was instaled in mid 2017. I can’t find the PIC and RID on My inverter. please contact our Service Line in US, they will help you. Can I register again for a device that I’ve deleted? Please contact your installer, he knows your system the best and will help you with the registrations of the device. Please contact your installer in this case. If he is not able to help you feel free to sign in on our Online Service Center and post your request.